Yes, it’s SuperTuesday today, the day when the world at large is sure to gain some clarity as to who are likely to be both the Republican and Democratic 2016 candidates for president. Time for a quick review of which cohorts of special citizens stand behind which candidates. Let’s proceed anyway. The first thing to keep in mind is Marco Rubio’s unique policy proposal to completely abolish taxes on interest, dividends or capital gains income from stocks. This naturally means that most hedge-fund managers are wildly in favor of seeing him occupy the Oval Office come next January. Supposedly Larry Ellison, Oracle founder, is also included within Rubio supporters. Otherwise, what can loosely be called Silicon Valley has some very nebulous and split allegiances. Anyone who pays attention now knows that Meg Whitman – formerly CEO of eBay, now of HP – did support Chris Christie, right up until he endorsed Donald Trump. Who she supports now? No clue. Bill Gates and Mark Zuckerberg are similarly cloudy as to their preferences – although, for different reasons, Herr Von Petersdorff is sure it’s a Democrat for both. Noted Libertarian Peter Thiel (PayPal) supported Rand Paul, as one would expect, and is now is said to favor Ted Cruz. As for current Microsoft CEO Satya Nadella – well, how about some clues: He’s an Indian immigrant, and he satteth at the right hand of Michele Obama at the last State of the Union speech. This means Hillary. Hollywood is also for Hillary: Jeffrey Katzenberg, head of DreamWorks Animation, and noted director Steven Spielberg. Maria Barra, CEO of General Motors, is also for Hillary – ’cause Obama saved her company’s bacon (and that of Chrysler, though the CEO there is Italian) a few years back. Note that there is no such current American VIP who Von Petersdorff was able to find who supports Donald Trump. Neither can The Donald expect support from big Republican donors such as the Koch brothers, Harold Hamm (“King of the Frackers”) or Sheldon Adelson. Wisconsin Governor Scott Walker was clearly the candidate in the Koch Brothers’ pocket, but he withdrew from the Republican race quite a while ago. Now it’s said they are going for Rubio – makes sense. Same for Sheldon Adelson, and this we know because that Las Vegas paper, the Review-Journal, that Adelson bought a few months ago to be his mouthpiece (and tried to keep the purchase secret) has endorsed Rubio. Of course, it’s easy to imagine there are certain supporters any candidate would not want, or at least would not be glad to have the support publicly known. That’s probably the case for those big Republican-supporting money-men just mentioned. Also, the degree of Wall Street support for Hillary is a very sensitive subject. The past record would seem to indicate both Goldman Sachs chief Lloyd Blankfein and JP Morgan CEO Jamie Dimon are definitely friends-of-Hillary, but Von Petersdorff reports they have kept mum about their presidential preferences for quite some time now. 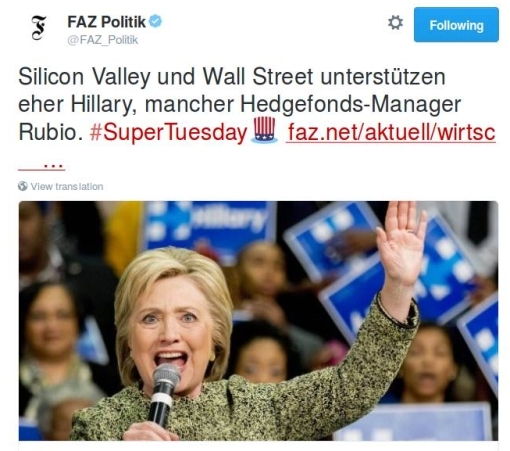 If you’re still intrigued about the Continental perspective on SuperTuesday – and can handle the German – the FAZ will have a live-blog today.